The morning ritual was as usual, and I left at 08:15 to get to the first conference talk at 8:30, which was a plenary session about "integrated imaging", or designing camera hardware and image processing algorithms jointly, instead of optimising each separately. There were also the best paper awards handed out during this session. M., on the other hand, spent the day by getting a 38 bus followed by a 44 to Golden Gate Park. She visited the California Academy of Sciences and the Japanese garden there while I was at the conference, and had a fun day. For lunch today I walked over to Chinatown and a picked a small restaurant called Snow Garden. I had kung pao prawns and rice, and an Asahi beer. The meal was delicious. On the way back I decided to walk up the hill to the top of Stockton Street, and climbed the steps to get above the Stockton Street tunnel, from where there were interesting views along the streets leading down the hill. Heading back to the Hilton, I passed a dry cleaner, and popped in to ask if they also did bag laundry washes. The woman said yes, and quoted a cost per pound, which I promptly forgot. The laundry was just a block from our hotel, so will be convenient for when we need to wash our clothes, probably on Friday or Saturday. The afternoon sessions of the conference were interesting, with one on HDR imaging which was very good. The last talk ended at 17:20, and then I came back to the hotel where M. was waiting. A bit later we went out for dinner, deciding to walk up to Fisherman's Wharf for seafood. When we got outside, it was sprinkling so we dashed back inside to get our umbrellas. The walk through the light rain was nice, with the streets slick and reflective by the time we got to the wharf. To pick a restaurant from the row of seafood places there, I looked at the signs above them, ignoring the gaudy new neon and choosing the oldest looking painted sign, which belonged to Nick's Lighthouse. A guy ushered us in and we got a table in one of the booths of which the seating was entirely comprised. Almost all the others were also full already. M. ordered a broiled salmon, which came with veges and rice, and a choice of clam chowder, lobster bisque, or salad with prawns. She got a salad without the prawns, and then had a choice of dressings and I picked a blue cheese for her. It came on the side, so she could choose to use some or not, and ended up having most of it. I ordered a whole cracked Dungeness crab, and chose the chowder with it. We also got sourdough bread, which was warm and delicious. The crab was large and came with a metal cracker and bowl for the shell pieces. It was a bit awkward extracting the meat at first, but I got used to it. And it was delicious. I also had a glass of Riesling to go with it, which was very sweet for a Riesling, but which matched the sweetness of the crab nicely. We thought about dessert, but the waiter said they only had three choices: chocolate cake, cheesecake, or tiramisu. When we looked dubious, he asked what I liked. M. said "ice cream", and he said to go across the street and find the gelato place. Or go to North Beach and find Stella's for Italian baked sweets. We'd seen a bakery there on Columbus Avenue on the way, with lots of pastries in the window, and M. asked if that was the one. The waiter said no, don't go there, it looks good but looks are deceiving. Stella's is on the other side of Columbus, right opposite, and is much better! Or, he said, go to Ghirardelli Square and get a sundae. 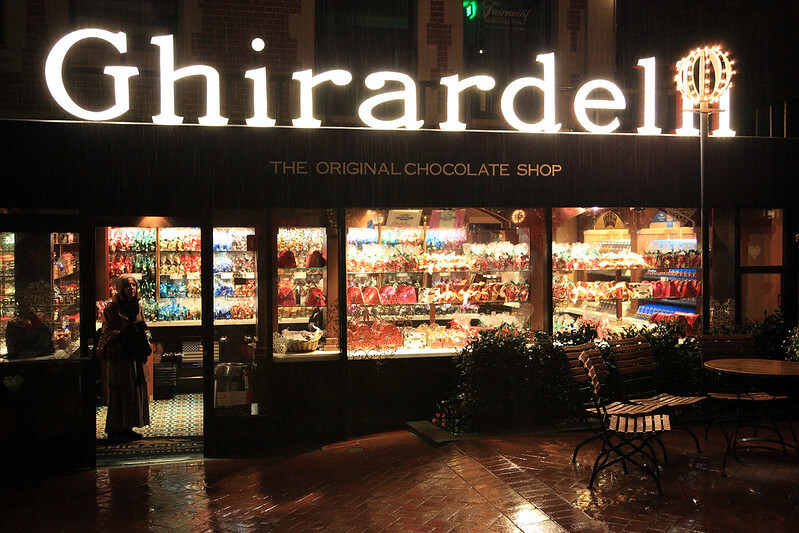 Ghirardelli Square in the rain. It was cherry ice cream with chocolate fudge sauce and whipped cream, and also delicious. M. settled for a "small" hot chocolate, which came in a tall mug that would have been called an extra large anywhere else. In the dining room there they have a display showing chocolate being made, mixed, and conched in huge copper vats. Enormous amounts of rich molten chocolate being stirred and releasing its aroma into the room. 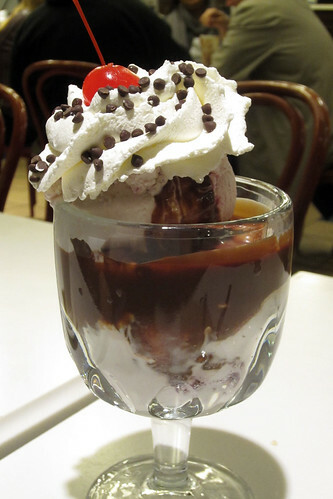 Muir Woods black forest sundae at Ghirardelli Square. After loading up on chocolate, we walked back through the rain to the cablecar terminus and got on a waiting cablecar, sitting on the outside front seats. There were only five other passengers on it. It left a minute later for the trip up the steep hills and eventually down towards Union Square. We got off at a stop right near our hotel and went in for the night. It was a very touristy day, but a lot of fun! Last updated: Wednesday, 26 March, 2014; 02:17:08 PDT.